I love roasting veggies. You can roast pretty much any kind and it enhances the veggie flavor like no other cooking method. I always roast a ton of veggies and eat them as a side or as the meal served on top of something like rice or quinoa. 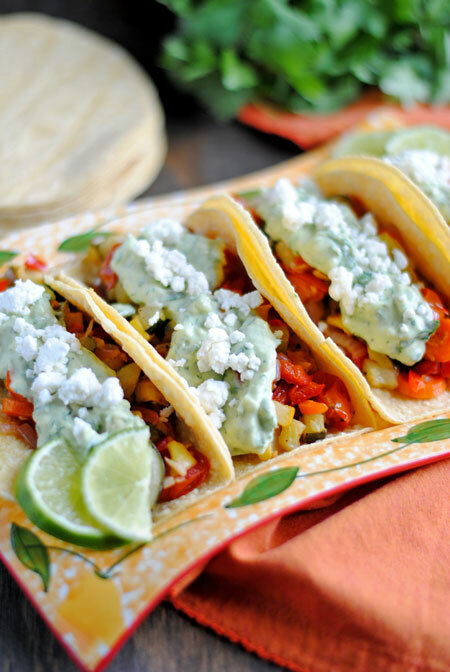 When I came across Roasted Veggie Tacos with Avocado Cream, I knew I had to make them. I welcome any new way of using roasted veggies and was instantly sold on the healthy avocado cream. I couldn’t shovel these into my mouth fast enough! They were crazy messy, so I’m pretty sure I looked like someone who hadn’t eaten in days. I was licking that incredible avocado cream off my fingers like a champ! I forgot to include the corn in mine, but there’s enough veggies that I didn’t miss it. Really you could use any combination of veggies you’d like. I wish I had skipped the cherry tomatoes though. I always forget that they turn to mush and leave their nasty little skins behind. I ended up picking those out of my tacos. This is really a forgiving recipe. You don’t have to follow it to a T at all. Use any kind of veggies you like, and use any ratio of the avocado ingredients you like. I ended up adding a cup of Greek yogurt, more lime juice, and more cilantro to my cream. Tasted just fine (and more to go around)! If goat cheese isn’t your thing, then go with what you like. I loved it! I didn’t really jive with the corn tortillas though. I think I just don’t like them in general and would’ve much preferred flour. Corn tortillas seem to always fall apart and have the texture of paper to me. You can easily save the leftovers by storing the veggies, cream, and cheese separately in the fridge. Then build your tacos as you want them. 1. Preheat oven to 400F. Toss veggies with olive oil, garlic, cumin, and salt. Roast until tender and lightly browning, about 20-30 minutes. You may want to toss veggies with spatula halfway into roasting (about 10-15 minutes in). 2. Whip together all the avocado cream ingredients and set aside. 3. 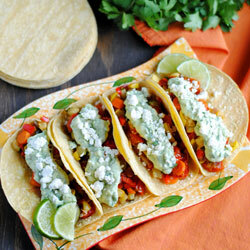 To assemble tacos, warm tortillas (in the microwave wrapped in a damp paper towel or in a skillet). 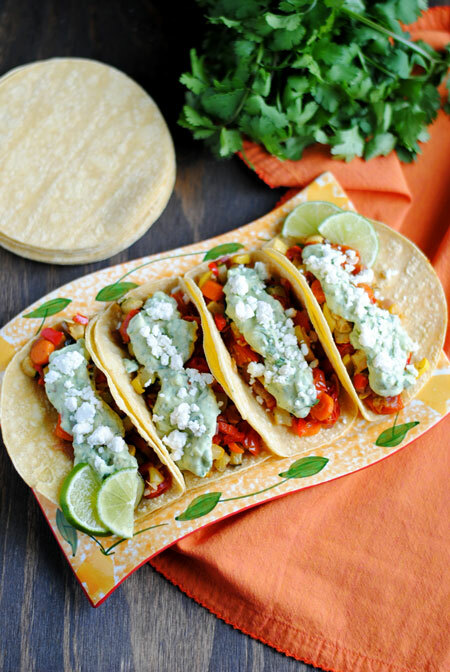 Add roasted veggies and top with avocado cream, goat cheese, and cilantro, if you like.